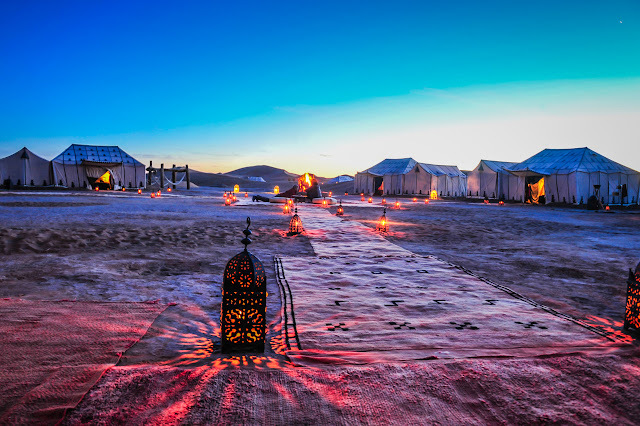 Destinations | Africa | Morocco | Marrakesh | Marrakech-Tensift-Al Haouz | Excursions | Marrakech to Merzouga 3 Days Tour | Dadès Valley and Erg Chebbi Camel Trek. Marrakech to Merzouga 3 days Tour, escape the busy streets of Marrakech's Medina for the stark beauty of the desert during this 3-day excursion to Mezrouga and Erg Chebbi. Cross through the Atlas Mountains via the stunning Tizi-n-Tichka pass, explore the UNESCO World Heritage-listed Aït Benhaddou kashbah and visit the desert oasis at Skoura. Then discover the Todra Gorge and the sacred city of Rissani before spending the night amidst the stark beauty of the Sahara Desert. This 3-day, 2-night excursion also includes a driver (who also serves as guide), 2 nights of accommodation (one at a desert camp), camel trek, meals as per the itinerary, round-trip air-conditioned transport from your hotel.